This car has been anticipated for so long. Since Acura revealed the concept of NSX at the Detroit Auto Show back in 2012, everyone engaged in auto world waited to see this one rolling to the markets or at least see it test-perform. However, despite many expected Acura to produce NSX shortly after the showcase, it did not happen, because the model was not quite fit for the mass production. According to the NSX’s engine designers, it was a ‘yellow-lit’ vehicle but they wanted to change it to ‘green-lit,’ so the designing process was stopped and changed to the hybrid layout. Was it worth the wait? Absolutely, since we can call this one a supercar without having any doubts. Its exterior is gorgeous and sharp from any possible angle, making it look like an iconic car, which it will certainly be. All elements used for the manufacturing of this beauty are innovative and provide an unprecedented opportunity for the owners in terms of performance, aerodynamics, and efficiency. The engine is one of the main news in this regard, so let’s start with it. There are four motors featured in 2017 Acura NSX, one V6 gasoline powered and three electric. As many expected, Acura went to make ground hugging, a mid-engine vehicle powered by a 3.5-liter V6 engine but it carries some differences from the original car. 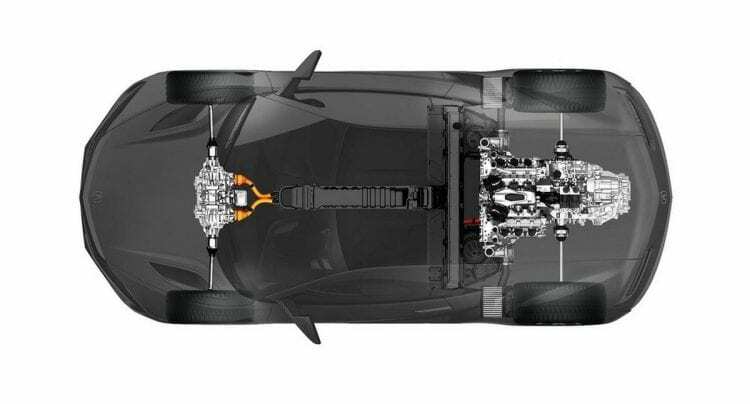 Specifically, it will feature a much more powerful twin-turbocharged unit with direct injection that will send power to rear wheels and has the help of electric motors. Moreover, the transmission has been changed as well: now it is a nine-speed dual-clutch version. According to Acura’s official website, this powertrain is able to generate around 500 horsepower, 7500 rpm and 406 lb-ft of torque. The performance of this beast truly matches its specifications, as it can reach 60 miles per hour in less than 3 seconds and can accelerate all the way up to 191 miles per hour. The Acura website says that the maximum total system power of the NSX is 573 horsepower and 476 lb-ft of torque. Quite impressive capabilities that will certainly be loved by speed enthusiasts. They will also love the fuel efficiency, which is estimated at 20/22 MPG city/highway. Two electric engines are placed on the back of the front axle and the third is located between the V6 unit and the transmission. Each electric motor is capable of producing 36 horsepower and 54 lb-ft of torque; the units on the axle are responsible for powering the front wheels in an independent fashion. This layout provides great acceleration and torque vectoring. Many reviewers have praised the accelerating capabilities of NSX, stating that it did not feel brutal and overwhelming even when the launch control feature was switched on. Instead, the acceleration was immediate and the engine did not produce roaring or ‘screaming’ sounds like some of the supercar counterparts of NSX from Italy and the United States. Prior to mass production of the model, Acura used the phrase “zero delay” to characterize it and we see that the company indeed achieved what it promised. There are four drive modes available in the NSX and they allow you to drive in every possible manner appropriate for the vehicle. The first one is the Quiet mode, which is perfect for sneaking away at 30 – 40 miles per hour (given that the driver does not step on it). Some of the engineers working on NSX project said this mode is quite different than one Ferrari has and contributes to the coolness that sports cars have when they drive slowly and noiselessly. The next mode is Sport, which is also a default one but can be changed to meet the preferences of the driver. It allows usage of much more power than the previous one and achieves the best fuel efficiency around 22-24 mpg. If Sport mode is not your limit and you want more, you can turn on the next mode called Sport Plus, which gets the performance at even more advanced level by allowing the engine to rev all the way up to 7500 rpm. Here, the driver gets help from the stability control assistant that cleans up the imperfect lines and doing many other things. The last driving mode, Track, will make the driver understand the Acura’s vision for the fast driving when activated expect to see some impressive track results. The inside of NSX clearly corresponds to the luxury style of sports vehicles. It features a two-seat cabin, which has a lot of beyond-cool features, such as 7-inch touchscreen, latest infotainment system, shift control unit, premium audio system and much more. The materials for sound-deadening and seats are also premium to ensure the maximum comfort during driving. In addition, the manufacturer offers the interior in four colors: Ebony, Orchid, Red, and Saddle. Without a doubt, this is a sporty vehicle and flat bottom steering wheel is offered and brings various buttons for in-car system control plus there are paddle shifters right behind it. The central part of the instrument cluster in reserved for rpm gauge so you can perfectly shift every time you decide to push this car little bit harder. As soon as you sit into this car it will hug you and hold you firmly giving you much needed the confidence to take on any corner even at higher speeds. NSX was built on an entirely new platform that uses innovative materials to make the vehicle as light as possible. Specifically, Acura used an aluminum and steel frame which features a carbon-fiber floor, which contributed to curbing weight to 3,803 lb without optional equipment. Despite using the most efficient materials for the platform, the new NSX still outweighs the previous generation model, which weighed 3,700 lb. However, this is not a sign of improper engineering solutions because 2017 version has a lot more features than the previous one, and the performance is not at all affected by slightly increased weight. Also, the company claimed to have provided the lowest center of gravity in the segment, which is certainly good news for steering and handling. Safety was clearly among the most important concerns of Acura engineers because they provided an advanced payload of both active and passive features. As the result, the NSX boasts electronic brake distribution, stability assistant, anti-lock braking system, brake assist, corner and backup sensors, cruise control, and many more others. So yes, it is very safe especially when we add the fact that it brings carbon fiber, high-strength aluminum, and steel components. How much does NSX cost? According to the NSX page at the Acura website, the starting price is $156,000. Also, customers can select to equip their vehicle with lots of optional features, which can increase the price by additional $10,600. If destination handling is also included in the price ($1,800), the final cost of NSX is $168,400. I think this will be a hit for Acura. It looks decent, better than competition and has great features.